Monsanto’s Roundup Ready system – a potent herbicide combined with genetically-modified seeds that can withstand it – has decimated the monarch butterfly’s only source of food in the Midwest, putting it on the edge of extinction, according to a new study. Biotechnology conglomerate Monsanto’s glyphosate-based Roundup has become the most common herbicide in American agriculture today, used in tandem with the company’s genetically-engineered Roundup Ready crops. Since its heavy proliferation began in the 1990s, glyphosate has been a leading killer of 99 percent of milkweed in the Midwest’s corn and soybean fields. Glyphosate-sensitive milkweed plants are the only spots where monarchs lay eggs, as the plant is the only food source for monarch larvae. According to the Center for Food Safety’s new report, “Monarchs in Peril: Herbicide-Resistant Crops and the Decline of Monarch Butterflies in North America,” these conditions have contributed to a drastic 90-percent drop in population for monarchs in their main habitat, crop fields in the Midwest. “This report is a wake-up call. This iconic species is on the verge of extinction because of Monsanto's Roundup Ready crop system,” said Andrew Kimbrell, executive director for the Center for Food Safety. As Monsanto is on the precipice of receiving US government approval for its next generation of the Roundup Ready system, the report raises the question of how much longer will the monarch survive? “Milkweed growing in Midwest cropland is essential to the monarch’s continued survival. Without milkweed, we'll have no monarchs,” said Dr. Martha Crouch, a biologist for the Center for Food Safety and a co-author of the report. In December, the US Fish and Wildlife Service said it may designate the monarch as a threatened species under the US Endangered Species Act. The agency review comes in response to a petition from the Center for Biological Diversity, the Center for Food Safety, and the Xerces Society for Invertebrate Conservation to list the subspecies of monarch (Danaus plexippus plexippus). 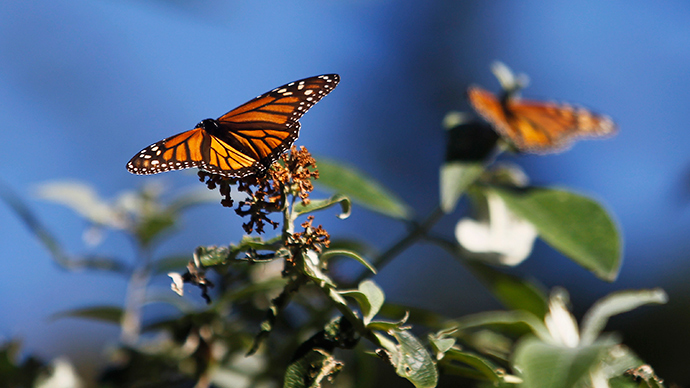 Disregarding their natural beauty, monarch butterflies play an important role in ecology. They carry pollen from plant to plant, helping fruits and flowers to produce new seeds. In their caterpillar stage, they are a food source for birds, mammals, and other insects. While milkweed can grow away from main cropland, there is an increasingly low amount of habitat that can support monarchs. Herbicide spraying over corn and soybeans fields that dominate the Midwestern Corn Belt leave monarchs to search for milkweed in other areas like roadsides and pastures, according to the report. Monarchs also produce four times more eggs per plant on milkweed growing in a crop field as opposed to milkweed sprouting elsewhere, the Center for Food Safety claimed. Monarchs are also threatened by global climate change, drought and heat waves, other pesticides, urban sprawl, and logging on their Mexican wintering grounds. Scientists have predicted that the monarch's entire winter range in Mexico and large parts of its summer range in the states could become unsuitable due to these threats. The report said that as monarch population sinks, they will likely become more susceptible to remarkable weather events. “Glyphosate is the monarch’s enemy number one. To save this remarkable species, we must quickly boost milkweed populations and curtail the use of herbicide-resistant crop systems,” said Bill Freese, a co-author of the report. As RT reported last month, the Department of Agriculture’s Animal and Plant Health Inspection Service approved Monsanto’s new GMO cotton and soybean plants. The company now awaits approval from the Environmental Protection Agency for it latest herbicide – a mix of the formidable chemical dicamba and glyphosate, which the company has developed for use on the newly-approved GMO crops. The new GMO crops – coupled with the dicamba/glyphosate cocktail – make up what Monsanto has dubbed the 'Roundup Ready Xtend crop system,' designed to trump super weeds that have evolved along with its Roundup biocide. For its part, Monsanto says it is seeking alternatives for the monarch. "At Monsanto, we’re committed to doing our part to protect these amazing butterflies. That’s why we are collaborating with experts from universities, nonprofits, and government agencies to help the monarch by restoring their habitat in Crop Reserve Program land, on-farm buffer strips, roadsides, utility rights-of way and government-owned land."